We are a leading Manufacturer of students memory enhancer mat from Chennai, India. Sitting over this MAT while Reading or Learning helps the Student to reach ALPHA state of Mind, which is the most ideal state of mind for Optimum Memory Retention and Recall abilities. Can be used from 5 years onwards. Clinically Tested and Neuro Doctor Certified. Already used by Thousands of Students in Malaysia and Singapore with great Success. This Mat has been tested extensively and Certified by a Leading Bio Energy Testing Organization. There cannot be a GREATER and Most useful Gift that one can make to a Studying Child or a Student, than this MAT. Price: Rs 1000/- per Mat. Remit the amount to our ICICI Bank A/c No: 007705009128-PORTOWORLD, KK Nagar Branch, Chennai 600 078. RTGS Code: ICIC0000077. E mail us your address and proof of remittance after he remittance is made. The product will be sent by courier. DISTRIBUTOR ENQUIRIES ARE WELCOME FROM ALL OVER THE WORLD. 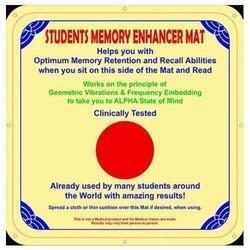 Looking for Students Memory Enhancer Mat ?